You are here: Home > General News > Koh Phangan introduces activity zones to protect the island against foreign investors. 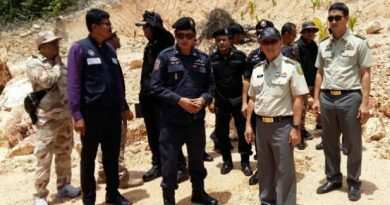 Hotel operators and local people on Koh Phangan have agreed to use their own tourism zoning to control existing activities and screen new developments, especially those by foreign investors, in the future. Koh Phangan is the country’s most popular destination for full moon parties, particularly among foreign tourists. Located in the Gulf of Thailand, the island has high tourism potential, thanks to its natural beauty. The formation of the Asean Economic Community will draw more foreign investment, especially from China and Singapore, to this destination. 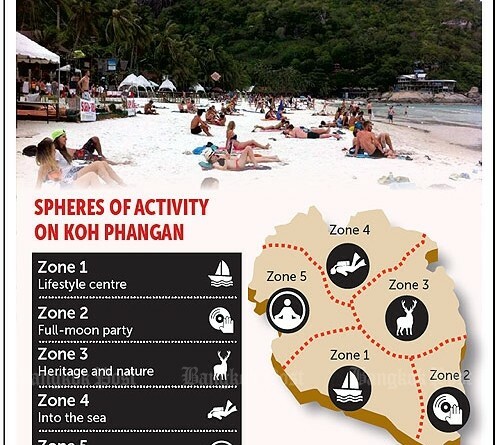 According to the Koh Phangan Hotels Association, the island now has five zones: Centre of Lifestyle, Full Moon Destination, Heritage & Nature, Into the Sea and Health & Wellness Tourism. Entertainment events such as full moon parties are permitted in two zones, the Full Moon Destination and Centre of Lifestyle. “Although this tourism zoning is jointly designed by local people and our association, we strongly believe that it is good enough to protect the island,” said president Thanyah Phoolsawad. At present, the island has 9,000 hotel rooms and 90% of them are run by local operators. Only Anantara Rasanada Koh Phangan Villas is managed by a professional hotel chain. The average hotel occupancy is about 60% all year round and hits 80% during the full moon party period. Mr Thanyah said foreign investors had approached some local people to buy their land plots. But the association and community leaders want to start a campaign to encourage local residents to protect their island. 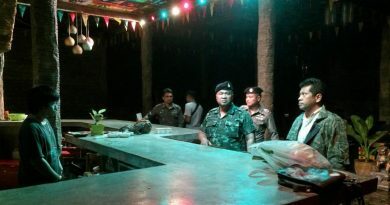 Koh Phangan has around 100 local volunteers who monitor tourism sites during the full moon party season and pass wrongdoers on to the police, and this shows the determination of local people who want to protect their homeland, Mr Thanyah said. “We don’t want to be like Koh Samui where more than 70% of hotel operators are outsiders and foreign investors. 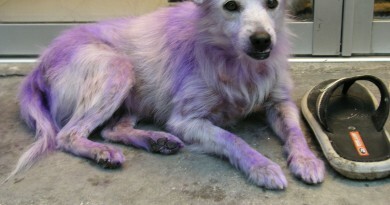 We have to protect our land and pass it on to our children,” he said. The island wants to welcome more Thai tourists to reduce the dependence on foreign travellers, who account for more than 95% of the total. The Koh Phangan Color Moon Festival 2015, scheduled for Dec 9-13, will be a key event to promote the island’s many interesting tourism activities and sites, such as the fishing community. There are also wellness resorts that offer yoga classes and detox and healing services in the Health & Wellness zone. Mr Thanyah said the revenue and number of visitors to the festival were expected to be double those of last year’s event. This year, the festival is expected to attract around 20,000 visitors, half of them Thai, generating at least 200 million baht for the five-day event. 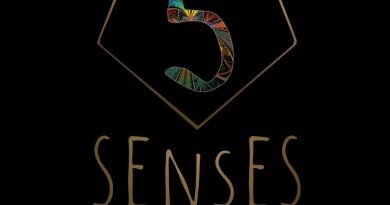 The association has joined hands with local travel agents to sell attractive packages for the festival with prices starting from 3,000 baht for three days and two nights. This year, Koh Phangan expects to welcome 1 million visitors, up from 800,000 in 2014. Thais are expected to make up 10% of the total number of visitors, up from less than 5% in 2014. Mr Thanyah hopes Thai travellers will reach 20% next year, when the number of hotel rooms is also expected to increase by 20%. Mr Thanyah said the price of beachfront land rose from 7 million baht per rai in 2011 to 12 million baht per rai this year. 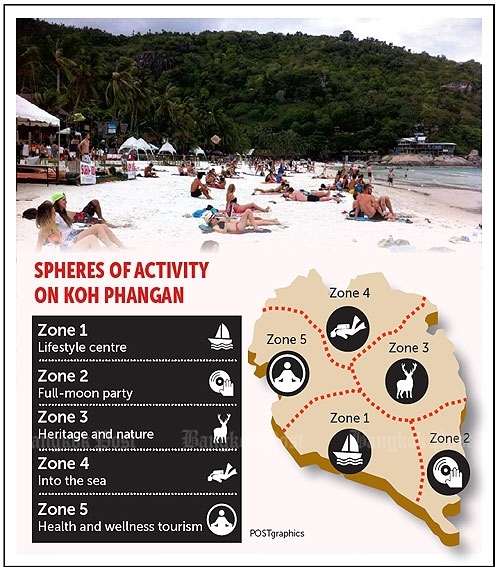 Thank you to Bangkok Post “Koh Phangan zoning will ‘protect island’” which was brought to us by Google Alerts. ← Koh Phangan airport construction suspended!